The ability to generate alerts based on price and availability changes is essentially the main feature of camelcamelcamel. To track a product, one sets a price threshold at and below which an alert is generated, assuming the product is also in stock. In this context, alerts can be thought of as log entries, which are delivered via email, Twitter, or RSS feed, containing current price information and useful links (Amazon product page, price watch page, etc). Registration is not required to use this functionality, nor do you even have to give your email address. 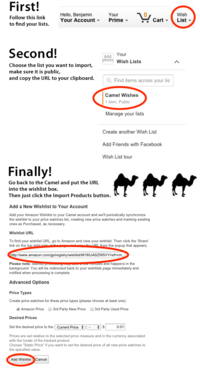 However, registered users get access to a single RSS feed containing alerts for all of their tracked products, in addition to the Camel Management page and the Wishlist Importer (see below). 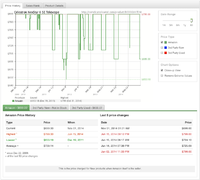 Price history charts are another major part of camelcamelcamel. 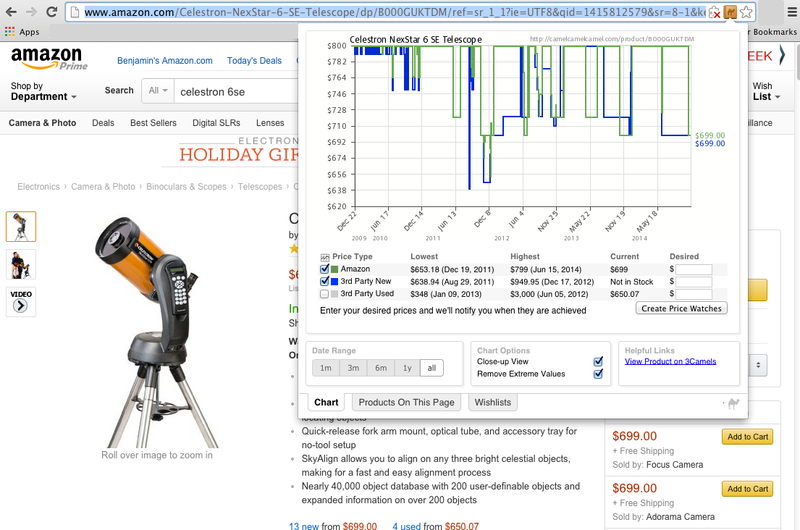 Every product page contains graphs of the price variations over time for each of the three price types, as well as the high/low/average prices. 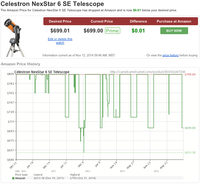 Price and availability data is updated from Amazon constantly to ensure it is as accurate as possible, but should always be checked on Amazon before making a purchase. 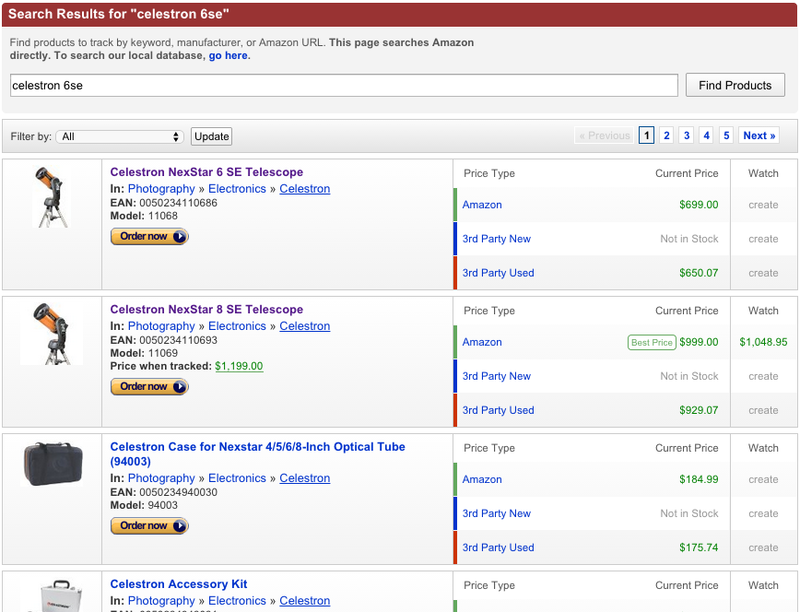 Search is accessed via the box at the top right of every page, or by clicking "Amazon Products" in the menu at the top of the page. Search results are displayed tabularly and, amongst other things, contain the Amazon/New/Used prices and links to price history RSS feeds for each price type, which are useful if you'd rather not actually create a price watch. We have browser add-ons for Mozilla Firefox and Google Chrome that support Amazon. 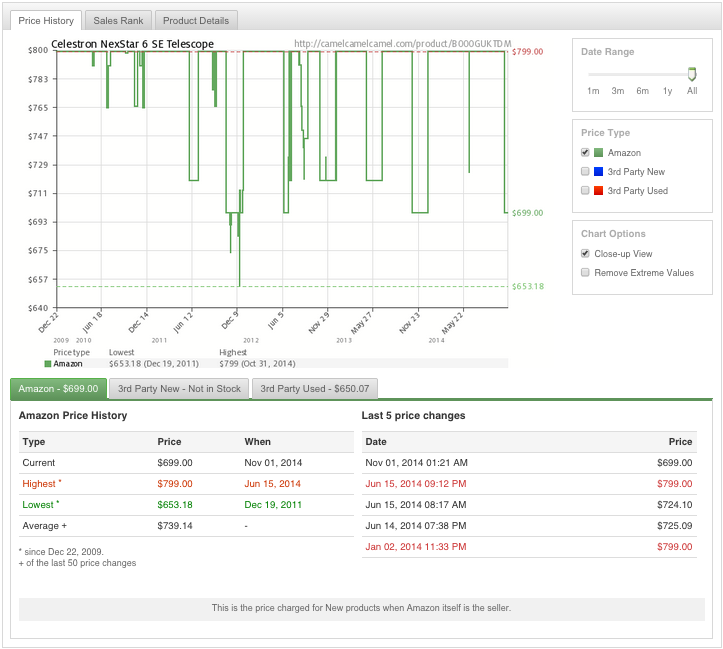 The Camelizer lets you view our price history charts without leaving retailer product pages, and makes it easy to create price watches when viewing retailer sites. Find out more about the Camelizer. 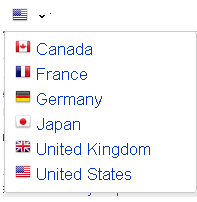 camelcamelcamel supports these Amazon locales: Canada, France, Germany, Italy, Japan, Spain, the United Kingdon, and the United States. 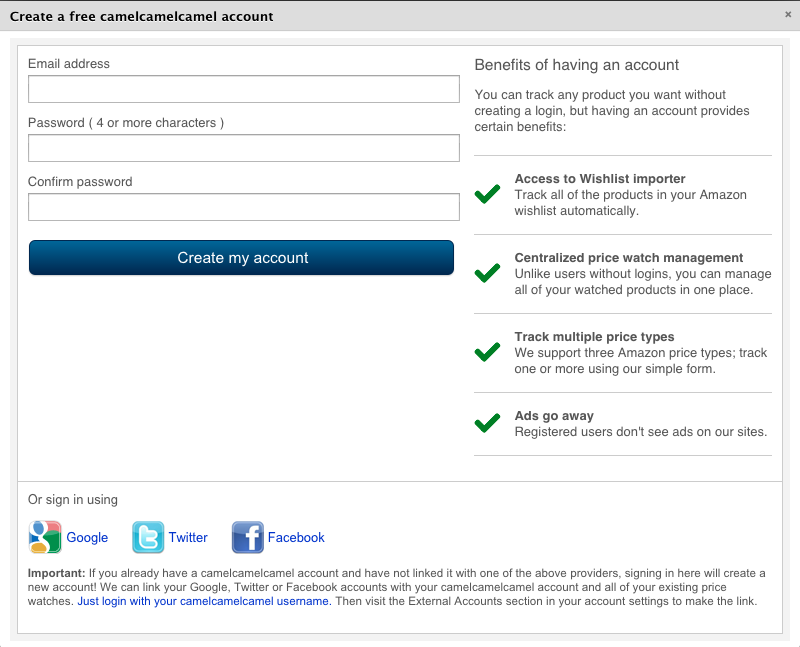 Signing up for things is a pain in the neck, so camelcamelcamel makes it completely optional. 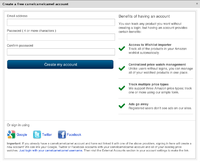 You don't even have to give your email address to track products, although it helps if you want to receive email alerts. If you don't, you can simply add the price watch's RSS feed to your newsreader and await the alerts patiently. If you do choose to sign up or receive email alerts, rest assured that I will not sell or distribute your information to anyone without your consent. Those brave souls who take the plunge -- much like Bastian in the Neverending Story 2 -- and register receive access to the Camel Management and Wishlist Importer tools, which are very useful and look good on your resume. Any price watches created prior to your registration, using the same email address, will be moved over to your account as we check them for pricing updates. This may take up to 8 hours or so, and they will appear to trickle in. 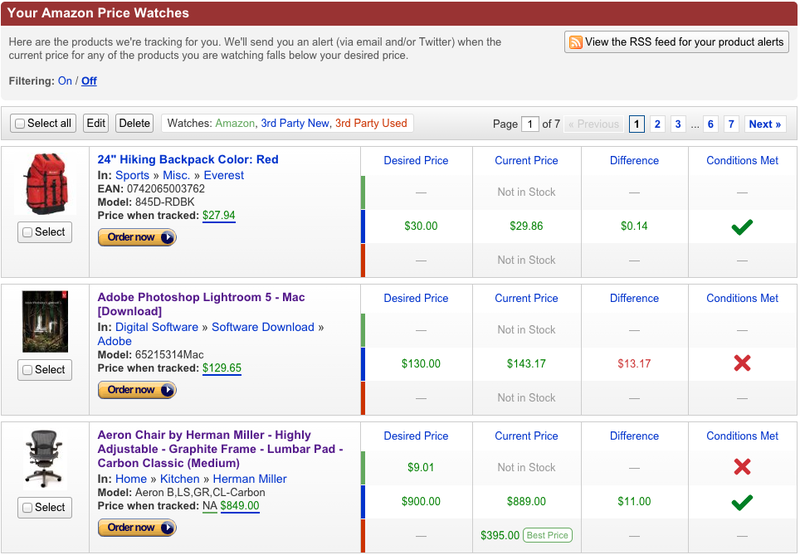 Accessible by clicking the "Your Price Watches" link at the top of every page, your list of price watch is laid out in table format: you get the name and picture of the product with a small description; your desired price as well as the price at which you began tracking the product, and the current price; and of course links to all manner of price watch, products, and Amazon pages. Status - is your price watch active (woot, the price you want! ), updated, unchanged, or perhaps new? 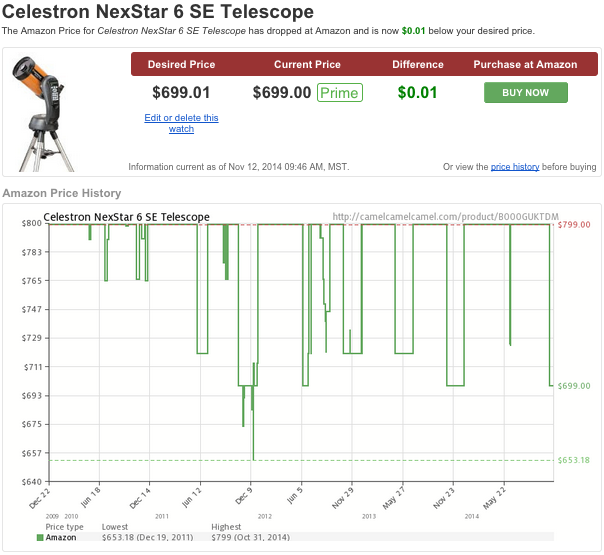 Price Type - there are three price types available for your tracking needs: Amazon, Third Party New and Third Party Used prices. You can track one or all three! 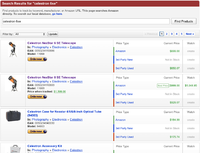 Category - this filter is based on the Amazon category of your tracked products. Artist - as a music fan I thought it would be nice to list the artists (with picture!) of any musical price watches you might have. Product Name - the first letter of every product you're tracking is made into a filter option. Your price watch list is automatically split into pages of 25. Also, each product has a checkbox; this lets you edit or delete multiple price watches at the same time, using the dropdown menu at the bottom of the list. The ability to import Amazon Wishlists was one of the earliest and most common feature requests. With it, you can import all of the products from any public Amazon list (Wishlist or otherwise); all it takes is the URL of the list. Once you submit that, camelcamelcamel reads the list information and imports the products which you have not already received/purchased, tracking them at "Amazon new price minus one". 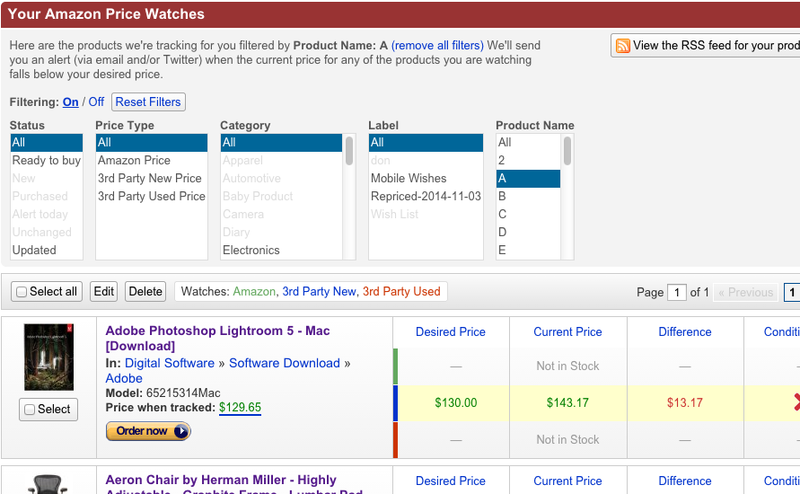 All price watches created using this tool are still editable and will appear under the "New" filter in the "Your Products" section of the site. 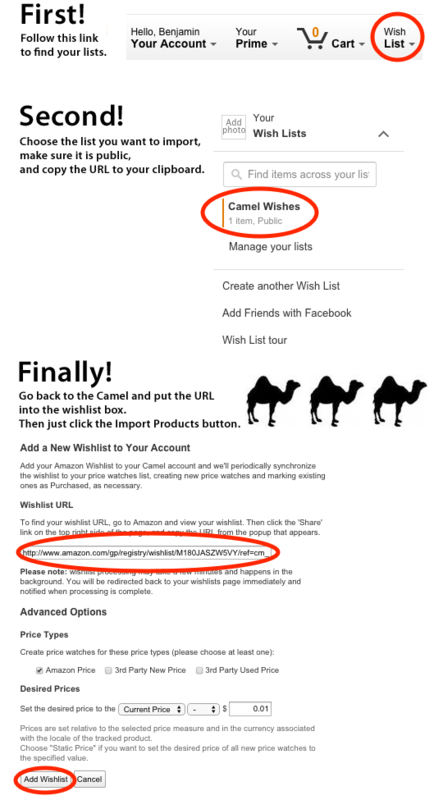 Please note that your Amazon login information is not needed to use this or any camelcamelcamel functionality.